For an island girl who grew up with sun, sand and sea, I’m unusually dependable on rainy dark days to get a creative flow going from scratch. If the sun is shining my brains struggles with creativity and I’ll need to be in an inspiring environment to think up new ideas. No wonder I never mastered art classes back then. My current job requires a certain level of creativity and having co-workers chipping in and brainstorm sessions gets me going, so I get things done on sunny days. This summer was supposed to be rainy, which it was not. On one hand I’m glad, on the other hand I need those rainy dark days to get started with a new idea. I’m working on a weblog post which right now I feel won’t see the light of day anytime soon, if ever. This is my last week of summer vacation, I already have a nice deadline lined up at work next week, so I doubt I’ll have time to sit and stare until I make more progress on that weblog post. Or maybe that will help, nothing like a good dose of procrastination when you have a looming deadline. Suddenly I’ll feel motivated to write and read anything but work. To try get the creative juices flowing I draw and doodle anything while thinking about everything and nothing but mostly food(and Schrödinger’s cat, I’m awesomely weird like that). While trying to get inspiration, I read a prose I wrote a couple of months ago and felt relieved I didn’t share it, it’s more something to share personally than to the whole world. Which brings me back to this post. While thinking about the aforementioned prose I thought about a haiku. Why not try writing a quirky haiku? The perfect antidote to a soul baring prose I’m glad I didn’t share. First thing, I googled how to write a haiku. 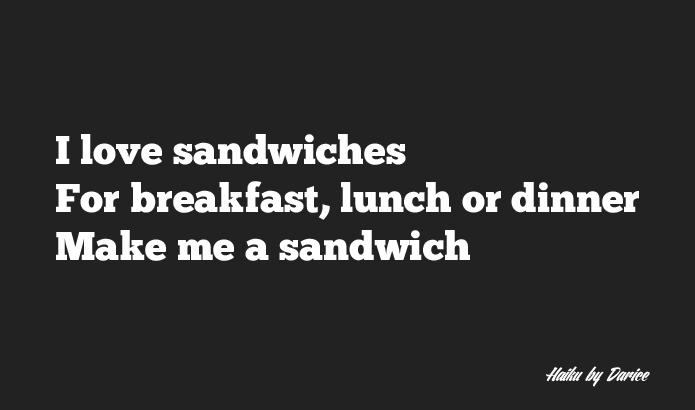 A basic haiku has three sentences with a total of seventeen syllables. First sentence must have five syllables, second sentence seven syllables and third sentence five syllables. Punctuation and capitalization are not required and it doesn’t have to rhyme. Second thing, read haiku to get a feeling for it. Third, write haiku. Thus a sort of creative flow has been created, despite the sun that has been shinning by day while the rain has been kept to nighttime.